From 13 May to 14 August the Kunsthaus Zürich will be displaying a hitherto unexhibited, comprehensive and multifaceted series of works by the sculptor and action artist Josef Beuys: Difesa della Natura (Defence of Nature). The centrepiece of the presentation, which features over 100 objects, photographs, documents, editions and videos, is Olivestone, a magnificent installation by the German artist that is being shown for the first time in the full context of its creation. For many years Joseph Beuys (19211986) made repeated visits to Bolognano, a small mountain village in southern Abruzzo where his friends Baron Buby Durini and his wife Lucrezia De Domizio owned an estate. Beuys activities there, undertaken together with the Durinis, soon turned into a series of long-term projects united by a motivation that was at once artistic, political, ecological and humanitarian. From 1973 to 1985 Bolognano became a venue for both discussions and agricultural activities which, in their turn, gave rise to sculptures, drawings, photographs, videos, tape recordings, blackboard drawings and editions. Thanks to the personal dedication of Baroness Lucrezia De Domizio Durini, these records have been preserved in their entirety. The particular importance of the exhibition lies in the clarity with which it demonstrates that the true goal of Beuys activities  in both the human and artistic spheres  was ultimately not to produce sculptures as such, but rather to improve society. Beuys expanded the concept of sculpture to encompass as its sole object the whole of human society. His plastic  both sculptural and formative  work must be viewed in a transcendental sense: its aim was to help a western world debilitated by materialism to achieve a new form of social coexistence based on direct democracy and free collaboration between all human beings in a spirit of solidarity, whatever their social, economic, religious, political and social background. This utopian horizon of a new social organism constitutes the true objective of his many and varied activities: Beuys philosophical concept is the social sculpture, the only work of art that enables human beings to improve the existing patterns of social behaviour. Taking as its starting point the masterly Olivestone, the exhibition looks back at Beuys actions and activities in Bolognano. This key work was donated to the Kunsthaus Zürich by the Durinis in 1992. The five stone basins from the early 18th century, which the artist chose himself in the Palazzo Durini, can now be seen once again in the context of their creation, surrounded by numerous items of manifold types that are on loan to the Kunsthaus. Joseph Beuys first visit to Abruzzo in October 1972 was followed two years later by the first important discussion, Incontro con Beuys, a socio-political action in the course of which blackboard drawings and a sculpture were created. Between December 1976 and February 1978 a number of events and actions took place which centred around the theme of agricultural renewal. These were followed by many more visits and works by Beuys, which together led ultimately to the celebrated action entitled Difesa della Natura. Beuys began planting a 15-hectare plot with 7,000 endangered shrubs and trees, entitling the grove Piantagione Paradise with an eye to both the future and the involvement of people interested in the issues that he raised. On 13 May 1984 Beuys was made an honorary citizen of Bolognano and planted the first Italian oak of his Piantagione Paradise opposite his studio as a symbol of the whole Abruzzo project, and launched a discussion entitled Difesa della Natura. He spoke about creativity and talked in depth about the objectives of his project, promising that it would be continued. The physical utopia of Beuys Difesa della Natura is transformed into a Difesa della Terra (Defence of the Earth). Difesa della Natura, then, is not simply a matter of ecological conditions; rather, it asks to be read from a predominantly anthropological perspective: the protection of humankind, the individual, creativity and human values  issues that are as topical today as they were back then. Curator Tobia Bezzola has worked with Lucrezia De Domizio Durini to present this and other projects by the artist. In an area covering more than 900m2 in the collection wing of the Kunsthaus, visitors are invited to take part in a human and artistic tour in which every work, however small, is at once a memorial and a document. A small niche displays the Rose for Direct Democracy. Stamps and photographs are drawn from the action 7000 Oaks, which Beuys created at documenta 7 in Kassel in 1982. A separate area is devoted to the Diary of Seychelles. A series of videos provide a record of conferences, performances and documentations, while alongside them are exhibited the editions and publications initiated by Lucrezia De Domizio Durini. peripheral are accorded central importance. Beuys himself regarded his multiples, over 25 of which he produced with and for Lucrezia De Domizio, as condensation nuclei, some of the most important vehicles for the dissemination of his ideas. In them, Beuys paraphrased the content of his actions and his political, social and pedagogical activities; they were designed to act as portable monuments, carrying his ideas out into the world and into the consciousness of human beings. In association with Electa/Mondadori publishers of Milan the Kunsthaus Zürich has produced Beuys Voice, a publication overseen by Lucrezia De Domizio to accompany the exhibition. More than 960 pages in length, it includes over 400 illustrations from the De Domizio Durini archive and is available in English, German and Italian. The book contains contributions and testimonies by numerous celebrated authors (among them Pierre Restany, Harald Szeemann, Felix Baumann and Johannes Stüttgen) who have devoted time to Beuys and the Difesa della Natura project over the years. It includes comprehensive documentation and commentary on Baroness Lucrezia De Domizio Durini and her decades of commitment to promoting the work of Joseph Beuys. In a conversation with Tobia Bezzola, she tells of her long friendship with the artist, the actions they produced together, and her unstinting efforts to document and disseminate his philosophy after his death. 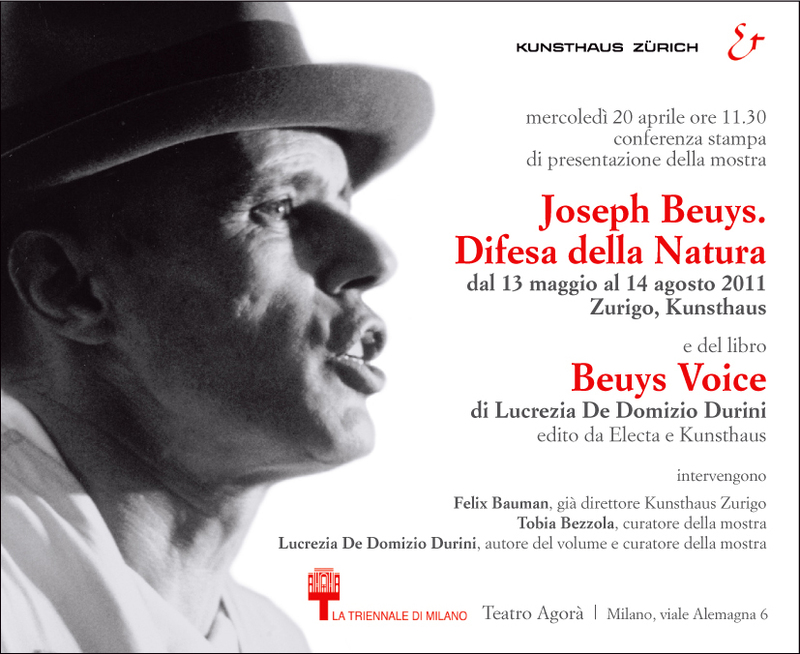 On 13 May at 7 p.m. in the lecture hall of the Kunsthaus Zürich there will be a performance of Beuys Voice Nr. 1, a composition by Umberto Petrin for vocalist (Susie Helena Georgiadis) and piano (Umberto Petrin). The texts are based on quotations from Joseph Beuys recorded in Bolognano on 13 May 1984. Supported by the Art Mentor Foundation Lucerne and the Ernst von Siemens Kunststiftung. Kunsthaus Zürich, Heimplatz 1, CH-8001 Zurich. Open Sat, Sun, Tues 10 a.m.6 p.m., Wed, Thurs, Fri 10 a.m.8 p.m.
For public holiday opening and public guided tours see www.kunsthaus.ch. Admission CHF 16 / CHF 12 (concessions). Visitors 16 and younger free of charge. Registration required for groups and schools. SBB RailAway combination ticket, with discount on rail travel and admission: at local stations and by phoning Rail Service: 0900 300 300 (CHF 1.19 per min. by ground line), www.sbb.ch. Magasins Fnac: sales points in Switzerland: Rives, Balexert, Lausanne, Fribourg, Pathé Kino Basel, www.fnac.ch; F: Carrefour, Géant, Magasins U, 0 892 68 36 22 (EUR 0.34/min), www.fnac.com; BE: www.fnac.be. To download visual material go to: www.kunsthaus.ch > Information > Press. Press conference with preview on Thursday 12 May 2011 at 11 a.m. TV crews by prior arrangement only. Dal 13 maggio al 14 agosto il Kunsthaus Zürich espone unampia, inedita e complessa «operazione» dello scultore ed artista dazione Joseph Beuys: «Difesa della Natura». Al centro della presentazione, costituita da oltre 100 lavori tra opere, fotografie, documenti, edizioni e video, è collocata la regale opera del Maestro tedesco: «Olivestone». Questopera maestosa viene esposta per la prima volta nellampio contesto in cui è nata. Per molti anni Joseph Beuys (19211986) tornò a soggiornare a Bolognano, un paesino di montagna negli Abruzzi, dove i suoi amici, il Barone Buby Durini e sua moglie Lucrezia De Domizio, possedevano una tenuta agraria. Le attività di Beuys in questo luogo, con la collaborazione dei coniugi Durini, assunsero ben presto la forma di diversi progetti artistico-politico-ecologico-umanitari. Dal 1973 al 1985 a Bolognano nacquero discussioni e lavori agrari accompagnati da sculture, disegni, fotografie, filmati, registrazioni sonore, disegni su lavagna ed edizioni. Queste testimonianze si sono conservate interamente grazie allimpegno personale della Baronessa Lucrezia De Domizio Durini. Limportanza particolare dellesposizione consiste nel fatto che essa dimostra con evidenza che il vero scopo delle attività umane ed artistiche del Maestro tedesco non consisteva nella creazione di sculture propriamente dette, ma nel tentare con tutte le sue azioni un miglioramento della società, unico scopo dellintera sua vita di uomo e di artista. Beuys ampliò il concetto di opera scultorea in modo tale che il suo vero e unico scopo dovesse essere la società umana. La sua opera scultorea, cioè «figurativa» nel senso formale, devessere letta quale opera scultorea trascendentale: la scultura di Beuys deve quindi aiutare il mondo occidentale, corrotto dal materialismo, ad adottare una nuova forma di vita sociale dai fondamenti democratici rivolta alla solidale e libera collaborazione tra tutti gli uomini del pianeta, pur nei differenti stati sociali, economici, religiosi, politici e culturali. Questa prospettiva utopica di un nuovo organismo sociale costituisce il reale obiettivo delle sue varie attività; il concetto filosofico beuysiano è la «Scultura sociale»: la sua famosa «Living Sculpture», lunica opera darte che serve alluomo per un miglioramento dei metodi esistenti nella società. Lesposizione si avvale della magistrale opera «Olivestone» come spunto per richiamare alla memoria le azioni e le attività di Beuys a Bolognano. Nel 1992 i coniugi Durini avevano donato questopera chiave al Kunsthaus Zürich. Le cinque vasche di pietra dellinizio del XVIII secolo, che lo stesso artista aveva scelto a Palazzo Durini, si possono ora rivedere, circondate da molti e diversi lavori concessi in prestito, nel contesto della loro genesi. Alla prima visita di Joseph Beuys negli Abruzzi, nellottobre del 1972, seguì due anni dopo «Incontro con Beuys», la prima importante iniziativa politica sociale intesa come discussione, in occasione della quale nacquero disegni su lavagna ed una scultura. Tra il dicembre del 1976 e il febbraio del 1978 si svolsero iniziative ed azioni aventi come oggetto il rinnovamento dellagricoltura. In seguito ci furono molti altri soggiorni e lavori di Beuys, e tutto si integra con il famoso progetto operazione «Difesa della Natura». Lartista inizia a piantare, su una superficie di 15 ha, 7000 arbusti ed alberi in via di estinzione dandogli il nome «Piantagione Paradise», con la prospettiva rivolta al futuro e il coinvolgimento di persone attente alle problematiche beuysiane. Il 13 maggio del 1984 Beuys riceve la «Cittadinanza Onoraria di Bolognano», pianta di fronte al suo studio la «Prima quercia italiana» nella sua «Piantagione Paradise», quale simbolo del complessivo progetto abruzzese, e si svolge la famosa discussione dal titolo «Difesa della Natura». Beuys parla di creatività e approfondisce gli scopi del suo progetto assicurandone la continuazione. Lutopia concreta di Beuys nel lavoro della «Difesa della Natura» si trasforma in «Utopia della Terra». La «Difesa della Natura» di Beuys non va intesa solo in termini ecologici, vuole essere invece letta soprattutto da un punto di vista antropologico: Difesa delluomo, dellindividuo, della creatività e dei valori umani. Temi oggi attualissimi. Il curatore Tobia Bezzola divulga insieme a Lucrezia De Domizio Durini questo ed altri progetti dellartista tedesco. Nella sezione della Collezione del Kunsthaus, in uno spazio di oltre 900 m², il visitatore è condotto ad attraversare una specie di viaggio umano ed artistico dove ogni minimo lavoro è ricordo e documento. In un piccolo reparto si presenta la «Rosa per la Democrazia Diretta». Timbri e fotografie provengono dallazione «7000 Querce», cui Beuys diede vita nel 1982 in occasione di Documenta 7 a Kassel. Al «Diario delle Seychelles» è dedicato uno spazio particolare. Conferenze, performance e documentazioni possono essere rivissute attraverso vari filmati. Sono inoltre esposti edizioni e pubblicazioni allestiti da Lucrezia De Domizio Durini. Dallintera mostra si comprende che in corrispondenza del concetto sociale di arte, secondo Beuys, acquistano unimportanza centrale anche forme artistiche che si considerano tradizionalmente piuttosto periferiche. In particolare le sue riproduzioni in serie - ne fece oltre 25 con e per Lucrezia De Domizio - rappresentarono per Beuys i veicoli più importanti per la diffusione del suo pensiero. Questi «multiples» dovevano quindi fungere da «nuclei di condensazione». In essi Beuys parafrasò i contenuti delle sue azioni e delle sue attività politiche, sociali e pedagogiche, e in quanto monumenti trasportabili dovevano convogliare le sue idee nel mondo e nella coscienza delle persone. Congiuntamente con la casa editrice Electa/Mondadori (Milano) il Kunsthaus Zürich edita una pubblicazione in tre distinti volumi, tedesco, inglese ed italiano, che accompagna lesposizione, dal titolo «Beuys Voice», curata da Lucrezia De Domizio e di ben 960 pagine e 400 immagini fotografiche dallArchivio storico De Domizio Durini. Il libro raccoglie anche contributi e testimonianze di numerosi illustri autori che nel corso degli anni si sono occupati di Beuys e delloperazione «Difesa della Natura» (Pierre Restany, Harald Szeemann, Felix Baumann, Johannes Stüttgen e m.a.). Esso comunque documenta e commenta nel suo complesso soprattutto limpegno pluridecennale della Baronessa Lucrezia De Domizio Durini a favore dellopera di Joseph Beuys. Intervistata da Tobia Bezzola ella riferisce della sua lunga amicizia con lartista, delle loro azioni comuni e del suo instancabile impegno a favore della testimonianza e della diffusione della filosofia del Maestro tedesco dopo la sua morte. In data 13 maggio, alle ore 19, nella sala conferenze del Kunsthaus Zürich verrà eseguita la composizione creata da Umberto Petrin «Beuys Voice Nr. 1» per canto (Susie Helena Georgiadis) e pianoforte (Umberto Petrin). I testi si basano su citazioni da Joseph Beuys, registrate a Bolognano il 13 maggio 1984. Con il sostegno delle Art Mentor Foundation Lucerne e Ernst von Siemens Kunststiftung. Kunsthaus Zürich, Heimplatz 1, 8001 Zurigo. Orario dapertura: sa/do/ma ore 10-18, me/gio/ve ore 10-20. Per lapertura nei giorni festivi e le visite guidate si veda www.kunsthaus.ch. Ingresso CHF 16.- / 12.- ridotto / gratis fino ai 16 anni. Prenotazione obbligatoria per gruppi e classi scolastiche. Biglietto combinato SBB RailAway-Kombi: riduzione su tariffa ferroviaria ed ingresso: alla stazione o presso il Rail Service 0900 300 300 (CHF 1.19/min. da fisso), www.sbb.ch. Magasins Fnac: punti vendita CH: Rives, Balexert, Losanna, Friburgo, Pathé Kino Basilea, www.fnac.ch; F: Carrefour, Géant, Magasins U, 0 892 68 36 22 (0.34 /min), www.fnac.com; BE: www.fnac.be. Foto ad uso della stampa scaricabili dal sito: www.kunsthaus.ch alla voce Information/ Presse. Lorientamento per i media con una prima visita avrà luogo giovedì, 12 maggio 2011, alle ore 11. Le troupe televisive sono pregate di prenotare. Aktionskünstlers Josef Beuys: Difesa della Natura (Verteidigung der Natur). erstmals im umfassenden Kontext ihrer Entstehung gezeigt. Buby Durini und dessen Frau Lucrezia De Domizio, ein Landgut besassen. Zeichnungen, Fotografien, Videos, Tonbänder, Wandtafelzeichnungen und Editionen. zusammen schliesslich zu der berühmten Aktion «Difesa della Natura» führen. und der menschlichen Werte - Themen, die noch immer hochaktuell sind. 7000 EICHEN, TAGEBUCH DER SEYCHELLEN U.V.A.M. in die Welt und das Bewusstsein der Menschen tragen. und Verbreitung der Philosophie des Künstlers nach dessen Tod. Öffnungszeiten: Sa/So/Di 10-18 Uhr, Mi/Do/Fr 10-20 Uhr. Feiertagsöffnungen und öffentliche Führungen siehe www.kunsthaus.ch. Eintrittspreise CHF 16.- / 12.- reduziert / bis 16 Jahre gratis. Anmeldung für Gruppen und Schulklassen obligatorisch. beim Rail Service 0900 300 300 (CHF 1.19/Min. ab Festnetz), www.sbb.ch. Pressefotos zum Download: www.kunsthaus.ch unter Information/Presse. um 11 Uhr statt. TV-Teams werden um Anmeldung gebeten. Du 13 mai au 14 août, le Kunsthaus présente un vaste ensemble d'oeuvres, inédit et riche du sculpteur et artiste d'action Josef Beuys: Difesa della Natura (Défense de la nature). «Olivestone», une installation majeure de l'artiste allemand, occupe une place centrale dans cette présentation comportant plus de 100 objets, photographies, documents, éditions et vidéos. Ce travail imposant sera présenté pour la première fois dans le contexte de sa création. Pendant de longues années, Joseph Beuys (19211986) a séjourné à de nombreuses reprises à Bolognano, petit village de montagne dans le sud des Abruzzes, où ses amis, le Baron Buby Durini et sa femme Lucrezia De Domizio possédaient un domaine. Les activités de Beuys dans ce lieu, entreprises en collaboration avec le couple Durini, ont bientôt pris le tour de différents projets à long terme  à caractère à la fois artistique, politique, écologique et humanitaire. De 1973 à 1985, des discussions et des activités agricoles se sont déroulées à Bolognano. En parallèle, des sculptures, dessins, photographies, vidéos, bandes magnétiques, dessins sur tableaux noirs et éditions ont vu le jour. Ces témoignages ont pu être conservés dans leur totalité grâce à l'engagement personnel de la Baronne Lucrezia De Domizio Durini. La signification particulière de l'exposition tient au fait qu'elle démontre de manière impressionnante que le but véritable de l'activité humaine et artistique de cet artiste allemand n'était pas en fin de compte la réalisation de sculptures en soi, mais l'amélioration de la société. Beuys a élargi la notion de travail sculptural dans ce sens que son unique objet devrait être la société humaine. Son travail plastique (c'est-à-dire constructif au sens formel) doit être compris dans un esprit transcendental: la sculpture de Beuys doit procurer au monde occidental malade du matérialisme une nouvelle forme de vie sociale et démocratique de base, appréhender une collaboration de tous les êtres de cette planète, même si ceux-ci sont d'origine sociale, économique, religieuse, politique et culturelle différente. Cet horizon utopique d'un nouvel organisme social constitue le but véritable de son activité diversifiée ; le concept philosophique de Beuys est la «sculpture sociale», la seule oeuvre d'art qui permet à l'homme d'améliorer les comportements sociaux existants. L'exposition part de l'oeuvre magistrale «Olivestone» pour évoquer les actions et activités de Beuys à Bolognano. Le couple Durini a offert cette oeuvre clé au Kunsthaus Zürich en 1992. Les cinq bassins en pierre datant du début du 18ème siècle, que l'artiste avait lui-même choisi dans le Palazzo Durini, entourés de nombreux prêts de toutes sortes, peuvent maintenant être vus de nouveau dans le contexte de leur genèse. Deux ans après la première visite de Joseph Beuys dans les Abruzzes en octobre 1972, eut lieu la première discussion importante, «Incontro con Beuys», action sociopolitique au cours de laquelle sont nés des dessins sur tableaux noirs et une sculpture. Entre décembre 1976 et février 1978 se sont déroulées des manifestations et des actions sur le thème du renouvellement de l'agriculture. Nombre d'autres visites et actions de Beuys ont suivi, conduisant finalement à la fameuse action «Difesa della Natura». L'artiste commence alors la plantation de 7000 arbres et arbustes menacés de disparition sur un terrain de 15 hectares, qu'il nomme «Piantagione Paradise». Cet acte, tourné vers l'avenir invite à la participation de personnes intéressées par l'ensemble des problématiques qui préoccupent Beuys. Le 13 mai 1984, Beuys devient citoyen d'honneur de Bolognano, plante en face de son atelier le «premier chêne italien» de la «Piantagione Paradise», symbole du projet abruzzais global et organise une discussion intitulée «Difesa della Natura». Beuys y parle de créativité et approfondit les objectifs de son projet, en assurant sa poursuite. L'utopie concrète de Beuys dans «Difesa della Natura» se transforme en une «Difesa della Terra» (Défense de la terre). «Difesa della Natura» n'implique pas seulement des conditions écologiques, elle veut au contraire être lue selon un point de vue anthropologique: protection de l'être humain, de l'individu, de la créativité et des valeurs humaines - thèmes qui n'ont rien perdu de leur actualité. Le commissaire Tobia Bezzola développe ce projet parmi d'autres en collaboration avec Lucrezia De Domizio Durini. Dans l'aile de la collection, sur plus de 900 m2, le visiteur est invité à suivre un parcours humain et artistique, sur lequel le moindre travail est souvenir et document à la fois. Dans un petit cabinet est présentée la «Rose pour la démocratie directe». Les tampons et les photos proviennent de l'action «7000 chênes» que Beuys a mise sur pied en 1982 à la Documenta 7 à Cassel. Une zone est spécialement consacrée au «Journal des Seychelles». Des conférences, des performances et des documentations peuvent être consultées grâce à plusieurs vidéos. De plus des éditions et publications initiées par Lucrezia De Domizio Durini sont également exposées. Il ressort clairement de l'exposition que, conformément à la notion sociale de lart développée par Beuys, certaines formes d'oeuvres, considérées habituellement comme plutôt marginales, acquièrent également une signification majeure. En particulier ses objets d'édition, il en a produit plus de 25 avec et pour Lucrezia De Domizio, comptaient pour Beuys parmi les plus importants véhicules de diffusion de sa pensée. Ces «Multiples» devaient aussi servir de «noyaux de condensation». Dans ceux-ci, Beuys paraphrasait le contenu de ses actions et de ses activités politiques, sociales et pédagogiques. Monuments transportables, ils devaient porter ses idées dans le monde et dans la conscience des gens. En collaboration avec les éditions Electa/Mondadori (Milan), le Kunsthaus Zürich publie à loccasion de l'exposition un ouvrage intitulé «Beuys Voice», sous la direction de Lucrezia De Domizio, comportant 960 pages avec plus de 400 illustrations issues des archives De Domizio Durini, en allemand, anglais et italien. Le livre contient des contributions et des témoignages de nombreux auteurs illustres qui se sont voués à Beuys et à son projet «Difesa della Natura» au fil des ans (Pierre Restany, Harald Szeemann, Felix Baumann, Johannes Stüttgen, entre autres). Il documente et commente avant tout, de façon détaillée, l'engagement de la Baronne Lucrezia De Domizio Durini pendant des décennies pour l'oeuvre de Joseph Beuys. Dans un entretien avec Tobia Bezzola, elle relate sa longue amitié avec l'artiste, leurs actions communes et son engagement inlassable pour la documentation et la diffusion de la philosophie de Beuys après sa mort. Le 13 mai à 19h, la composition d'Umberto Petrin «Beuys Voice Nr. 1» pour chant (Susie Helena Georgiadis) et piano (Umberto Petrin) sera interprétée dans la salle de conférence du Kunsthaus Zürich. Le texte est basé sur des citations de Joseph Beuys, enregistrées à Bolognano le 13 mai 1984. Grâce au soutien des fondations Art Mentor Foundation Lucerne et Ernst von Siemens Kunststiftung. Heures d'ouverture: Sa/di/ma 10h18h, me/je/ve 10h20h. Pour les jours fériés et les visites guidées publiques, consulter www.kunsthaus.ch. Entrée CHF 16.- / 12.- tarif réduit /gratuit jusqu'à 16 ans. Inscription obligatoire pour les écoles et les groupes. Magasins Fnac: Points de vente CH: Rives, Balexert, Lausanne, Fribourg, Pathé Cinema Basel, www.fnac.ch; F: Carrefour, Géant, Magasins U, 0 892 68 36 22 (0.34 /min), www.fnac.com; BE: www.fnac.be. Téléchargement de photos de presse sur www.kunsthaus.ch, sous Information/Presse. La conférence de presse avec pré-visite aura lieu le jeudi 12 mai 2011 à 11h. Les équipes TV sont priées de s'annoncer.